The Slow Food movement and the Mediterranean Diet were born there. Food is more than sustenance -- it is a joy of life. McDonald's has had a difficult time in Italy, reports Elena Kostioukovitch in "Why Italians Love to Talk About Food." Some boycotts led to closures, franchises were forced to conform with local architecture and -- instead of hamburgers -- the restaurants serve "brioches, and slices of panettone, and . . . an excellent espresso." No wonder the chain had to adapt to survive. As demonstrated during her delightful culinary wanderings, good food is fundamental. Italy is the birthplace of the Slow Food movement and the Mediterranean Diet, recent results of Italians' long love affair with their country's rich and varied bounty. They talk about food because it is an ardent daily quest, a shared passion, a "declaration of belonging" to a family or city or region; they talk about food simply because it affords such joy. Kostioukovitch, a Russian who immigrated in 1988, spices her enlightening observations with both an outsider's and evolving insider's appreciation. She travels to 19 provinces, from the Veneto and Lombardy in the north, through Liguria, Tuscany and Puglia to Sicily and Sardinia farther south. Each chapter sketches the region's history and geographical characteristics, which influence its contemporary cuisine. For example, while mountainous Trentino Alto Aldige (South Tyrol) is "almost polar" and its foods have obvious Austrian origins, in the Marches of the east coast, "everything that can be stuffed is stuffed, from wild boars to tiny olives." Along Campania's Amalfi coast, fertile land and abundant water support wheat farming as well as a specialty: water buffalo breeding. Rather than cow's milk, buffalo milk makes "a wonderful masterpiece," mozzarella di buffala. Why Italians love to talk about food is repeatedly brought home by Kostioukovitch's mouth-watering descriptions. For instance, Valle d'Aosta, which borders France, produces "the best chestnut honey in Europe" along with cheese aged in its mountain caves. Fondue had its start here, a meal that brings people together. Its Martin Sec pears are unforgettable when baked with red wine and cloves then topped with whipped cream and served with a glass of grappa. Each chapter ends with a roundup of typical products from the region and its noteworthy dishes. She also interweaves sections on related topics. Pasta and pizza are two natural choices. Pasta is versatile, economical and attractive, available in more than 700 shapes. There are two kinds: fresca, made with egg binder; and secca, made with water and dried. As early as the 14th century, sailors took dry pasta -- an invention of coastal cities -- to sea; Columbus stocked vermicelli among his ships' stores. Pizza, Kostioukovitch claims, is "the second most popular Italian dish" after pasta. Like McDonald's hamburgers, this late 19th century Neapolitan creation of drizzled olive oil and delicious toppings served on an "edible plate" didn't catch on. But later, the dish found its way back from American pizzerias with returning emigrants as well as soldiers after World War II, ensuring its popularity. Both foods bring people to the table, pasta at home, pizza at trattorias. Speaking of eating out, a chapter on restaurants helps the uninitiated toward eating well in Italy. Breakfast is a "terribly meager meal," Kostioukovitch explains. Expect nothing more than a tiny cup of strong coffee and a brioche perhaps filled with ice cream. Cappuccino is good, but never order one after noon. To find a memorable meal, ask friends, hotel staff, taxi drivers. Be observant: Old ladies don't like to waste money, so follow their lead. Or on any highway, look for stops with plenty of trucks outside. Once seated, read the menu. Consult the waiter. Opt for specials. And, most of all, observe the "sacrosanct" order of courses. The first course is pasta or risotto, not pizza. Second comes meat or fish. Side dishes arrive on separate plates, followed by desserts (mostly for tourists and not at the meal's end), fruit and cheese, espresso and perhaps brandy. Pastry shops are for the rich, Kostioukovitch says, but "street food" from outdoor vendors can be marvelous. Above all, eat in the countryside, which assures freshness while supporting local economies. 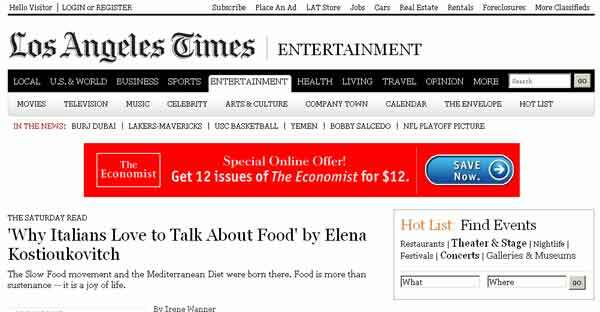 Why do Italians love to talk about food? The reasons, Kostioukovitch shows, are endless. Wanner has written for many publications, including the San Francisco Chronicle, the Seattle Times and High Country News.